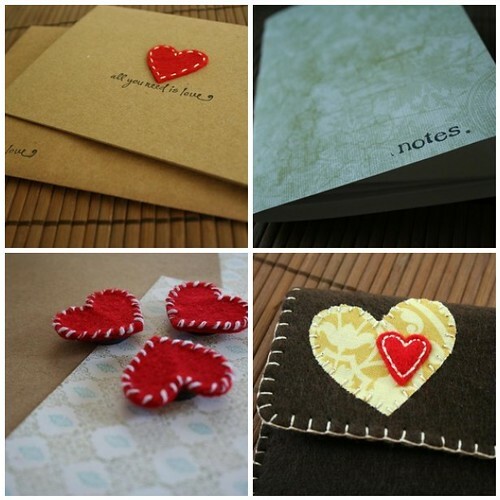 1. felt heart brown notecard set, $8. 2. green 'notes' notebook, $5. 4. felt wallet with double hearts, $12. Awww, such cute things! I used my wallet last night and got complimented on it from my friends. :-) Enjoy the rest of your weekend! Do you post to Britain? I so need those wee heart magnets! My yellow with red accessories kitchen would look awesome with some of them in it! Ohh I like you're new items! They're adorable. I like your little note books. Oooh those hearts are too precious! so cute! i love your shop!